Market forces are pushing health systems to rethink their approach to defining and encouraging patient-centered care. 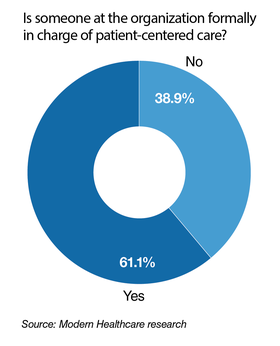 The term patient-centered care, first coined by the Institute of Medicine in 2001 and defined as ensuring patients guide their own clinical decisions, has become commonplace in healthcare. But CEOs of top health systems say the term and approaches to providing it need a revamp in order to address evolving consumer expectations. 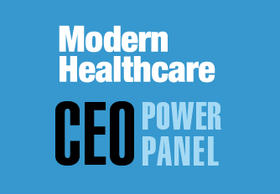 According to results from Modern Healthcare's most recent CEO Power Panel Survey, nearly 65% of the healthcare executives have changed how they define patient-centered care over the past five years, and they overwhelmingly assign multiple components to the definition. 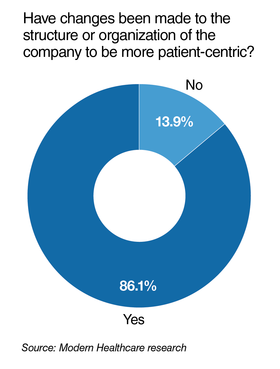 Most CEOs responded that the term means more than just involving patients in their care decisions. It includes ensuring patients have access to services, care is coordinated and patients are provided education materials and resources. Health system executives have started to re-evaluate how they engage and interact with patients in their care as consumer expectations increasingly demand more personalized and less fragmented healthcare experiences. The new mindset is a major change from previous years, said Jim Hinton, CEO of Baylor Scott & White Health in Texas. “Historically, health systems have been very focused on the clinical interaction that a patient had in an ambulatory space or a hospital room, and now we have broadened it to be anything that touches a patient in any way, including ways in which we can anticipate the needs of patients to make their entire care process more efficient and easier for them,” he said. CEOs are taking various approaches to address the new demands, but technology is a big one. The vast majority (94.4%) said they are making investments in technology to improve patient care. About 97% responded they have deployed mobile apps to engage and interact with patients. Further, 80.6% said they have invested in apps for providers, while 88.9% use electronic health records and 47.2% use wearables. Intermountain Healthcare CEO Dr. Marc Harrison said providing services to patients digitally is going to be a big part of the system's strategy going forward. “You figure, you run your life off your smartphone. You are going to want to use it to make appointments, get advice, without being inconvenienced,” he said. In addition to typical consumer services like online appointment scheduling, Salt Lake City-based Intermountain has made substantial investments in telemedicine, and plans to expand those services going forward. “We are initiating a strategy around digitization of our footprint,” he said. “We know patients do better in terms of their outcomes if they are engaged,” said Catherine Jacobson, CEO of the Milwaukee-based system. Roughly 8,000 patients and about 240 Froedtert providers have used the platform, sold by Patient Wisdom, since it launched in 2016. Along with greater investment in digital tools, health systems are also looking to improve care coordination and address social determinants of health to better engage with patients. “It is important we look at removing barriers that might lead to barriers to care,” said Kevin Lofton, CEO of Catholic Health Initiatives, based in Englewood, Colo.
CHI received a $2.5 million grant in August 2017 from the Robert Wood Johnson Foundation to study the social and environment issues that affect the health of individuals across three states. The initiative will allow CHI to better identify and address the unique challenges of certain populations. “We should be looking to improve the overall health of people, taking those social determinants of health into account … so the best course of action can be determined,” Lofton said. Minneapolis-based Allina Health is looking for ways to engage with patients beyond their clinical health, and as part of those efforts created a consumer engagement team. Allina recently restructured its marketing and communication arm to include a consumer insight function. The health system now goes out into the community or arranges patient focus groups to better understand consumer expectations. For instance, during a recent meeting with cancer patients, Allina heard from a patient who felt after his cancer diagnosis the system left him in the dark for several days before he clearly understood next steps or the severity of his disease. Wheeler said it was a wakeup call. “We have to do better at supporting and holding hands with patients during those times,” she said. Starting this year, Allina began screening patients in its emergency departments and clinics related to issues around housing and food insecurity, transportation challenges and domestic violence. About 25,000 people have been screened so far and 40% had at least one challenge. The EHR flags this for the caregivers, who then work to connect patients with community resources before they leave. Edward-Elmhurst Health in west suburban Chicago has tried to look for ways to make the care experience for its patients smoother and better coordinated. “One area the industry struggles with is the seamless part, not just looking at the patient episode but their entire journey throughout the healthcare system. In healthcare we tend to see more silos,” said Mary Lou Mastro, CEO of Edward-Elmhurst. To better understand the patient journey, Edward-Elmhurst launched a project last September in which it follows patients throughout their interactions with the system from start to finish. The project has initially focused on 75 cardiology patients. “We did focus groups with employees, physicians and patients to try to understand what the pain points are for them,” Mastro said. A complaint that Edward-Elmhurst repeatedly heard from patients in the group was that communication wasn't effective. To address that, the system has implemented digital information boards in hospital rooms that show patients their schedule for the day. Information about their treatment and their caregivers is posted as well. Efforts are underway to roll out the same services in the system's clinics. Overall, CEOs believe that changing how employees engage with patients is a big focus area to improve patient engagement. About 83% of CEOs responded in the survey that they train their employees on ways to be patient-centered. Additionally, 61% of CEOs said they have someone formally in a role addressing patient needs, although the titles vary. At Irving, Texas-based Christus Health, physicians are receiving new training designed to improve patient communication. Doctors shadow their colleagues who perform in the top 99th percentile on patient experience surveys to learn best patient communication tactics. The coaching sessions focus on five main areas: offering the first few minutes of an appointment to listen to the patient, narrating the visit especially during the physical exam, summarizing key points of the visit, using the teach-back method to assess the patient's understanding of the care plan, and hand-washing at the start of the appointment in view of the patient. Christus started the physician shadowing sessions two years ago in its northeast Texas region and plans to roll them out across the whole system later this year. Christus CEO Ernie Sadau said the approach reflects a recent focus by the system to ensure patients are driving their care. “It's part of ensuring we are relating to the patient and their family about their care and that we understand what outcomes they want and what they are expecting from us,” he said. But pushing staff to rethink how they interact and speak to patients can be a tough sell. Jacobson at Froedtert said staff can be resistant to changes, especially things like extended or weekend hours or using new tools.